The HSRC is committed to cutting-edge research that supports development nationally, in the Southern African Development Community (SADC) and in Africa. Our commitment to the dissemination of that research demonstrates the remarkable and measurable impact of our work. 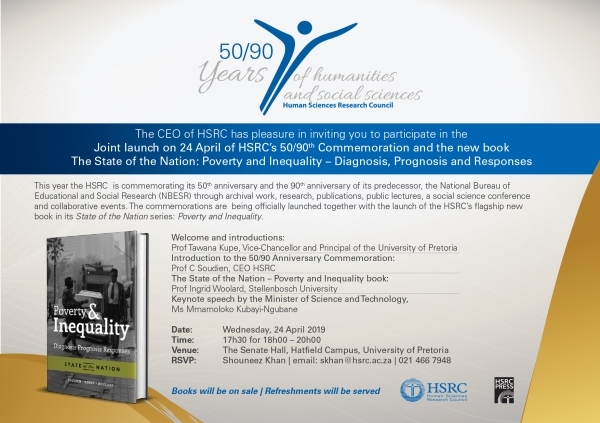 Science and Technology Minister Kubayi Ngubane will deliver the keynote address at the joint launch of the HSRC's 50/90 Commemoration and latest release of the book State of the Nation: Poverty and Inequality. The aim of this study is to understand the importance of strong social cohesion in the cities of Cape Town and Rio de Janeiro, which suffer from high levels of inequality, poverty, and violence. More info.